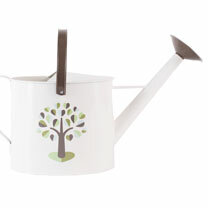 Bring some garden charm to your indoor or outdoor space with this beautiful watering can. Suitable for use as a decoration item or used as a practical addition to your garden, this product measures 21cm high, 25cm wide and 18cm deep. Made from powder coated steel with a subtle front facing design.